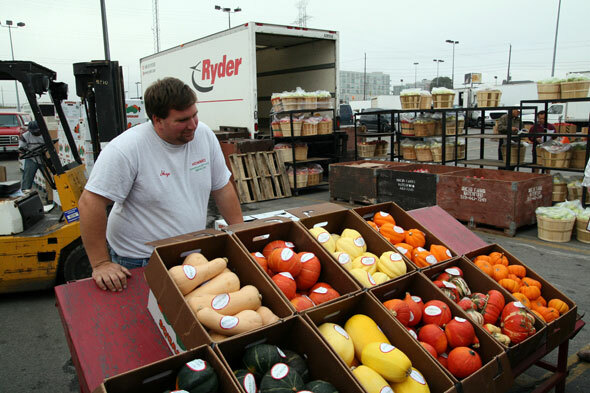 The Ontario Food Terminal (OFT) is the largest wholesale fruit and produce distribution centre in Canada, and the third largest in North America after LA and Chicago. It sits on a 40 acre lot at the foot of Etobicoke. Nestled next to the Gardiner Expressway, the OFT is in full view to thousands of Torontonians every day on their way in and out of the city but few have ever entered its doors. It's not open to the public. It's a strictly wholesale operation and a vendor permit and $155 fee (paid every two years) is required for admission. As a fan of urban infrastructure, I've always wanted to get a peek inside and finally this past week I got my chance courtesy of a tour organized by the Alphabet City Food Festival. Here's what I discovered. First, some history. The OFT wasn't always here. Toronto's original wholesale market was at the St. Lawrence Market from the 1800s to 1954 when the OFT was opened to relieve the congestion occurring at Front and Jarvis. It's current location is optimally located close to the city and next to major transportation routes including Pearson International Airport. With the exception of what you'd find at national retailers like Walmart and Loblaw, almost all the fruit and vegetables in the city filter through the OFT. It's the source for local grocery chains like The Kitchen Table, small family-run grocers like Maple Produce, Chinatown vendors and many local restaurants. The national chains might even shop here once a week to supplement their usual inventory if there's a supplier shortage or quality issue. Except for a brief interruption during the 2003 North American Blackout, the OFT never closes. It's open for deliveries 24 hours a day, 365 days a year. Inside and outside, the OFT is a hub of activity. 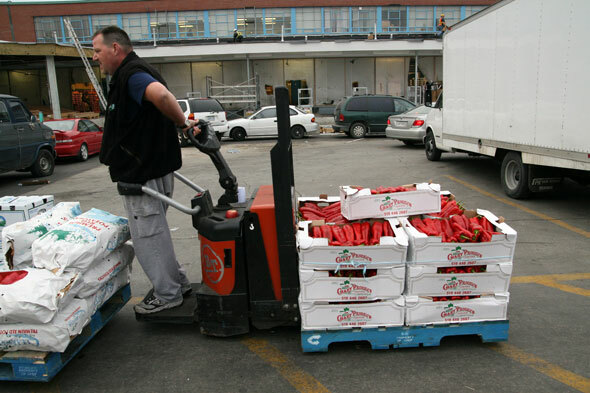 Trucks are in perpetual states of being loaded and unloaded, buyers are inspecting produce, sellers are looking to cut deals, forklifts whiz back and forth with inventory being moved, like hundreds of red peppers or a crate of raspberries worth thousands of dollars wholesale. 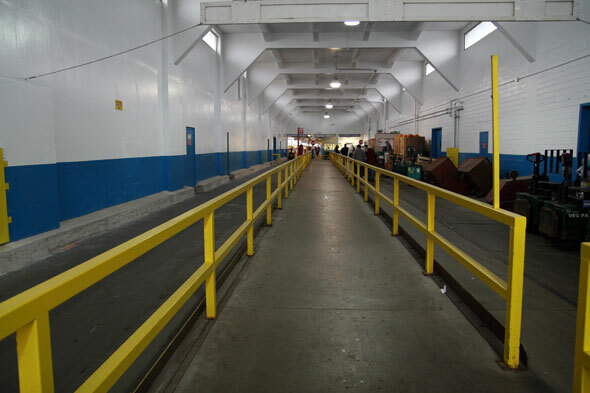 Long hallways connect different parts of the facilities, from its 80,000 square feet of cold storage to its 10-acre outdoor farmers market where on the day I visited a box of sphagetti squash could be had for $15. 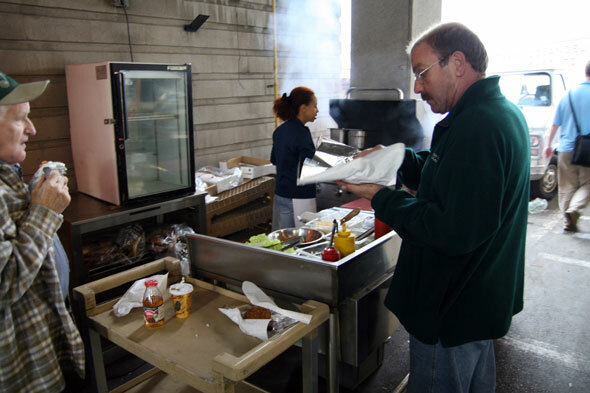 There's also a small flower market, a couple of stalls selling fresh-baked pies, a coffee shop, a restaurant and a hot dog stand, all enjoying what looks like brisk business. For many participants here, the buying and selling starts at 2am and doesn't let up until about 8 hours later. The collection of fruit and vegetables I saw was among the best looking I've ever seen. 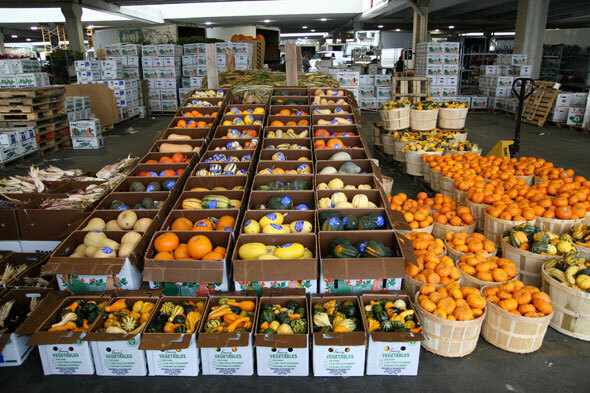 While much here is shipped from international growers, the farmer's market is well-represented by local farmers who truck in their product daily. This being October and close to Thanksgiving, pumpkins, squash and root vegetables were in abundance. Farmers pay $3.14 a square foot to be able to sell stuff here and haggling over prices is standard. 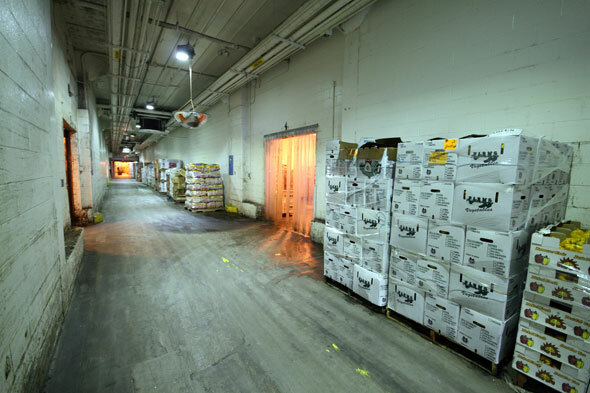 The whole operation is overseen by the Ontario Food Terminal Board and disputes are policed internally. Its 67 cameras recording video to catch would-be thieves are just a line item of the $8 million of expenses the OFT board incurs each year. 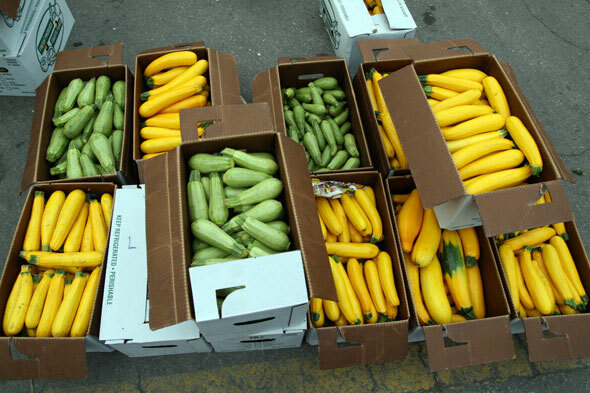 But with a revenue rate exceeding that by $1 million, the operation is profitable, self-sustaining and receives no government support or preferential treatment despite its status as an agency of the Ontario Ministry of Agriculture, Food and Rural Affairs. The thirty-year leases held by the most powerful grocers in the city are renewable in perpetuity, privileging a small number of family-owned businesses that have kept a tight hold on their terminal rights for over three generations. The business is so robust, and the leases are so sought after, that each one is estimated to be worth over a million dollars in annual economic returns. That a serious amount of money flows through here shouldn't come as a surprise. During downtimes, workers like those below can be seen engaging in a game of cards. Money is being exchanged here too if the wads of twenties I saw gripped by some participants is any indication. 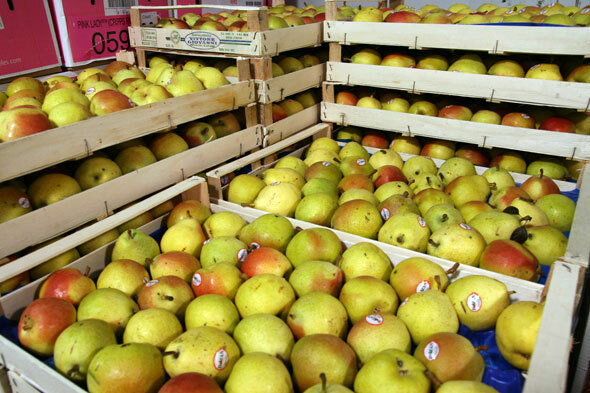 Pears as seen inside the cold storage facilities. They're fresher than they look at the typical grocery store. 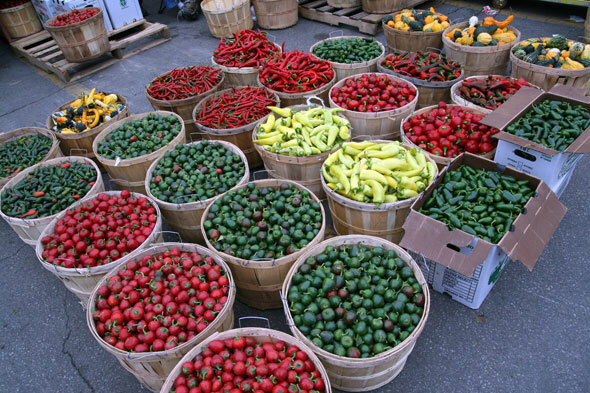 Baskets of vegetables like these peppers are a common sight in the farmer's market. 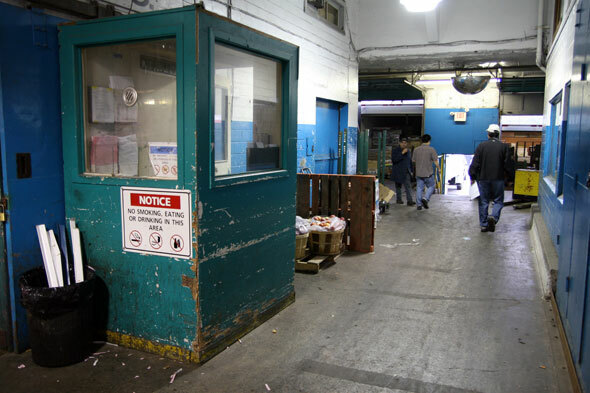 If you liked this article you might also like Inside the South Central Letter Processing Plant.